To renew your ad, login to your Daft account. You will be brought to the 'My adverts' tab within your account. Under the 'Active ads' heading, you will see your ad. Below the number of days left is the 'Renew' option. You can renew your ad once every 24 hours. Renewing your ad bumps it up to the top of the listings (apart from sales ads). If it's a standard ad it will move to the top of the standard ads and if it's a premium ad, it will move to the top of the premium ads. 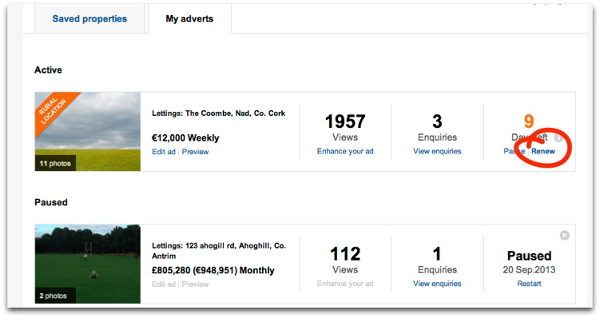 Letting and Sharing ads need to be renewed at least once every 7 days for properties in Dublin and every 14 days for properties outside Dublin. If your ad is not renewed, we will assume that the property is no longer available and your ad will be deactivated automatically. Sales ads need to be renewed every 90 days.